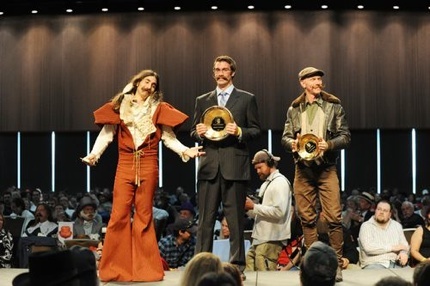 Pro skater Patrick Melcher (right) finished second place in the “Imperial” division of the World Beard And Moustache Championships in Anchorage, Alaska. The reigning champ, musician Alexander Antebi, preened and vamped his way to third place in what he dubbed his “Ziggy Czar Dust’ getup, professional skateboarder (and Bristly Chap) Patrick Melcher took second place, and Benjamin Juergens came out of nowhere to take first place in his first-ever competition. Bet those rides are going to go for more than a quarter now that it’s a champion. . .